When we think construction, we think nuts and bolts, two-by-fours and steel beams. Construction has never been overtly forward-thinking or technologically progressive, but the industry is transforming before us, riding the digital wave. Drones and unmanned aerial vehicles (UAVs) have found their way into the construction industry and they are drastically changing the landscape. Using advanced data analytics and imagery captured by drones, companies have strengthened their infrastructure and optimized daily business operations. The formation of new structures requires a wide range of participants, and to successfully complete a project stakeholders must bring together those moving parts, funneling those resources into a unified force. By incorporating drones into the equation, the revolving parts have the ability to see through the same lenses from different vantage points, levels, and locations. The kicker: this data transmits in real-time, allowing instant and seamless collaboration between all stakeholders. With no delay, drones send the data they are collecting from way up high and send it directly back to the operators. Drones have the capability to capture images no human resource could alone, creating a holistic picture of the operation. We receive revolutionary perspectives, dissolving the dissonance between contractors, architects, and clients, as they all receive a uniform report of the daily happenings. These images have the power to resolve industry pain points that have haunted the construction industry from the dawn of time. Here was examine some of those pain points, discussing how our clients are applying drones in the construction industry to smooth over their current speed bumps. High-quality aerial imagery and video footage captured by UAVs can be combined with drone-generated sensor data to create accurate 3D BIM models and renderings. These tools are often used to help community leaders and clients see the viability of a project. Additionally, they can be used to promote a project to potential investors by helping them visualize the finished development. Since the inclusion of drones, land surveying has become more efficient and cost-effective. Companies no longer have to rent expensive equipment and hire a dedicated team of contractors to map out an area or property. This makes the planning stage less time-consuming and inexpensive without sacrificing on quality or quantity of data. We can learn how to build more sustainable structures, how to do this faster, and how to reduce resources in the meantime. Remote monitoring is probably one of the most obvious applications of drones in the construction industry. Supervisors might not necessarily work on-site and clients can be half way across the world from the construction site of the building they are financing. The use of camera drones can give investors and clients an up-close and personal view of the ongoing project while they are off-site, which greatly helps improve customer relationships and makes managing projects remotely easier for project managers. Safety is of optimal importance in construction. UAVs allow construction project managers to observe sites in great detail from a remote location without putting workers at risk. The information gathered from these inspections can be used to enhance workflows or develop new site logistics plans that identify areas of interest. Accidents happen, inevitably. The construction industry operates in high-risk environments, and although there will always be lapses in safety, drones give us the ability to greatly reduce these lapses by catching safety violations as they happen and delivering that information to supervisors. From there, supervisors can discourage the behavior from reoccurring and use the evidence however they deem appropriate. OSHA reports that nearly 40% of the total injuries in the construction industries can be attributed to falls. By using drones, we can better understand why incidents occur, taking the measures to reduce the number of incidents per capita. Drone-generated data allows construction managers to create more accurate 3D BIM models and high-resolution orthomosaic maps that measure true distances and elevation. 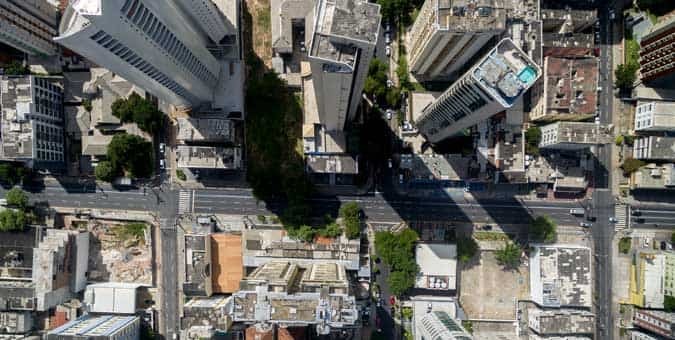 By overlaying drone-generated point cloud data over the 3D BIM model, project managers can track up-to-date progress on projects, trim costs, and identify mistakes before they can produce costly setbacks. In most cases, drone software can be integrated with in-house programs currently in use, as well as with popular Autodesk design tools like AutoCAD, InfraWorks, Civil 3D, Navisworks, and Revit For construction companies, the return on investment (ROI) is enough of a reason to support the adoption of drones. UAVs cost less to fly and take faster, more accurate measurements than a human survey team. They can be operated remotely to collect additional data on a site as many times as needed while removing any risks associated with sending workers to a potentially dangerous location. The intelligence generated by drones allows construction project managers to distribute their resources with greater efficiency, increases safety, and reduces overall project costs.